Featured in O (The Oprah) Magazine, USA Today, Huffington Post, Good Morning America, and voted one of The Best Spiritual Books of 2010. Laughter, like music, is a universal language. And Susan Sparks speaks this language like no other. Laugh Your Way to Grace weaves humor and the sacred into one beautiful work of art. If you want to blast some fresh air into your spiritual life, then by all means read this book! Laugh Your Way to Grace is a welcome addition to my collection. A provocative case for adding leavening levity to sacred spaces where it might be sorely lacking. Humor and theology — together? Absolutely! And Laugh Your Way to Grace is the blueprint for the relationship. This pioneering book taps ancient wisdom about laughter which we all innately have, but often forget. Susan Sparks reconnects us with this power by reminding us, page by page, that we can chuckle and grin our way toward life abundant. You could buy this book just for the chapter titles or the great quotes that begin each section — but you would miss the chance to laugh your way to grace. Susan Sparks takes us on a journey from Mother Teresa’s orphanage to a cross-country ride on a Harley with unforgettable stops in between…This is not a book filled with jokes, but with the surprising humor that comes from paying close attention to life….When you come to the end of this book you’ll want to pass it on to someone who has never imagined laughing on the spiritual path. They will surely thank you. Rev. 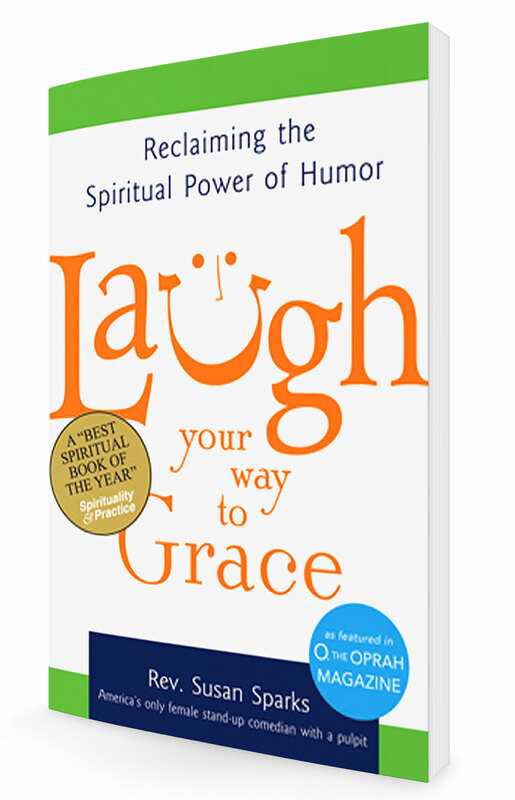 Susan Sparks has written the definitive book about how humor and laughter have everything to do with God….Laugh Your Way to Grace has done more for me than most of the theology books I’ve been forced to plough through. I’m still smiling…and contemplating. I read Laugh Your Way to Grace on a day when the weight of the world felt especially heavy on my shoulders. By the time I finished reading and laughing, the burden was lifted, proving Susan Sparks’ point: laughter is a spiritual practice that empowers the human heart to fly.